A couple of months ago, fellow Perth sewer @homesewnstuff put a call out for bra foam for her Sophie swimsuit. I had some spare so offered it to her and she gave me the Camber Set pattern in return - how awesome is that?! This dress is just my style. 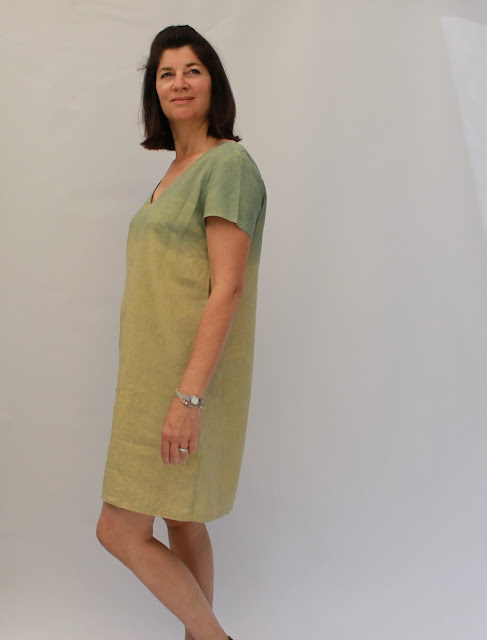 I wanted to make it from this green Irish linen that I had bought in Singapore, but I only had one metre. I managed to just squeeze the pattern on to the fabric, but had to piece together the back yoke and line the yoke with white cotton. 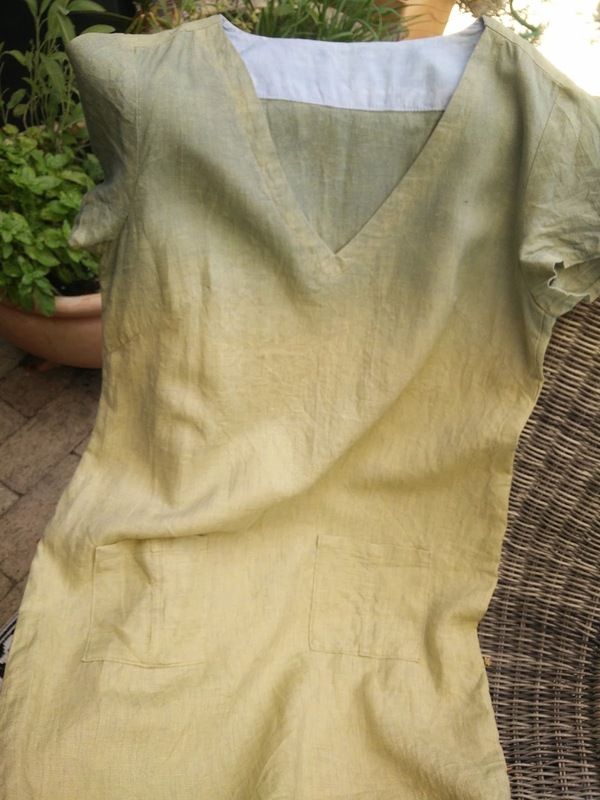 I changed the neckline to a V-neck, as I prefer a lower neckline, and made a cotton facing to finish it off. Once the dress was finished, I decided the colour needed a bit of a boost. It was feeling kind of washed out (below). The obvious choice was to dunk it into my indigo dye vat, with which I have been experimenting lately with great vigour. I will have to write about that soon as it's all very exciting. Well at least it is to me. Be prepared for all my future clothes to be blue! I didn't want to completely lose the original colour of this dress, so I just dyed the the top portion. I lowered it into the dye to chest level and slowly out to create an ombre effect. 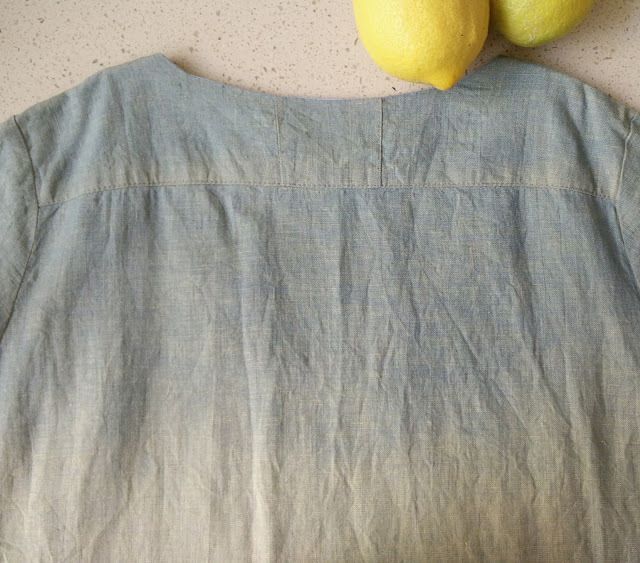 Indigo dye works quite quickly, so I began slowly lifting the dress out as soon as it had gone in. I counted the seconds and lifted at a rate of about half a centimetre per second, so the shoulders were only in for about a minute. My indigo is quite light, so the effect is subtle, but I think the dye it gives the dress a lift. After wearing the dress, I decided it needed pockets, so I pieced together two pockets from my tiny scraps and sewed them on. Perfect and just in time for summer. Thanks @homesewnstuff for the excellent pattern! It's really pretty and I love the dye job! I'm sure you're going to love wearing it during the summer. Wow, how gorgeous and summery. I love the pop of blue - it really does elevate the dress to something really special. The ombre dye was inspired. This dress will be in constant rotation I'm sure. 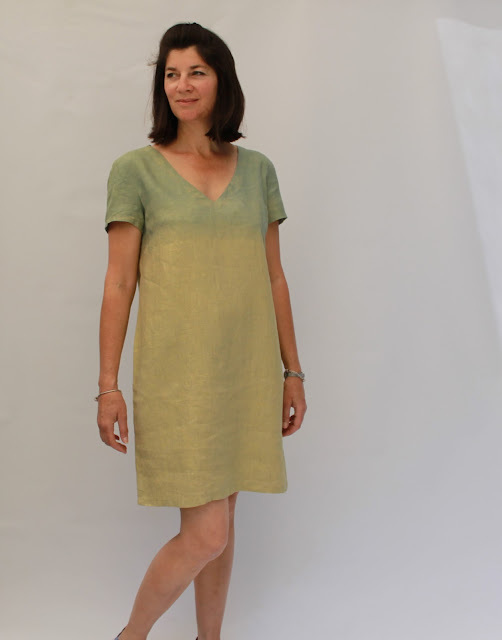 A lovely summery dress made all the more special with the subtle use of the dye. A very unique garment. Great work. Such a lovely dress. You always have such a good eye to transform simple garments into stunning pieces. Beautiful dress Megan! Love the dyed effect! Perfect amount of dye . Loving dress and good swap for some foam. What a gorgeous dress! the little bit of ombre dyeing is beautifully subtle and the perfect feature... very inspiring! !